Bring your own wine, and keep it in perfect condition until you get there. This convenient cooler holds one or two bottles, and it keeps them totally protected and easily transportable. Thick insulation will protect your glass bottles as it maintains the temperature of your wine for up to four hours. This stylish, black tote is way more classy than a brown paper bag, so it's the perfect choice for gift giving, or looking good when you show up to your next dinner party. A durable nylon exterior will provide long lasting storage, and the bold and colorful interior helps to immobilize each bottle, and prevent damage. A middle divider separates two bottles, or keeps one upright by itself, and the interior mesh pocket cradles your wine to keep it safe while you're on the go. The whole top opens up for easy access, and a zipper closure keeps things secure at all times. Reinforced handles on either side make it easy to carry, and comfortable for long periods. Optimal wine drinking temperatures: Whites are best served at 44-48 degrees, and reds will be best when consumed while at 56-62 degrees. Looking for one with a larger capacity? Check out the 4 Bottle Version. It's the same thing only bigger. Want something to chill and serve your wine? Our Freezable Wine Pouch gives you a frosty sleeve to chill your bottle, and handle to serve it. 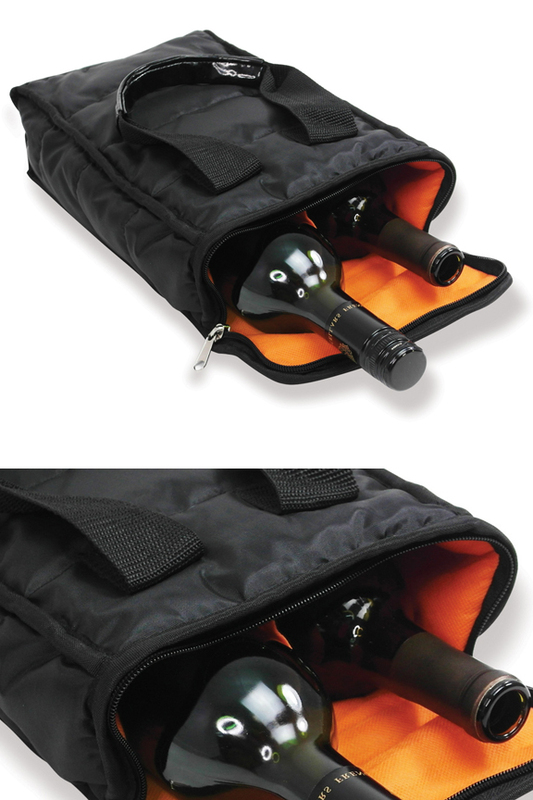 As another option, our Wine Cooler Bag has a freezable internal sleeve and a puffy exterior that zippers shut. Dimensions 4.5" x 7.5" x 12"
Uses Store, protect, carry and keep cool one or two bottles of wine. Perfect for parties or family get-togethers. Insulation provides padding to reduce impact, but also maintains temperatures. Integrated Handles Yes - 2 reinforced carry handles, one on either side. Compatibility Intended for use with standard size, 750ml Bottles. Middle Divider Yes - Keep one bottle upright alone, or keep two separated. Cooling Ability Help to maintain temp for hours. Washing Spot clean or hand wash for best results. A convenient way to transport wine. Keep one or two bottles safe and secure, and maintain temps if desired. A large opening allows for easy entry, and built in handles make carrying a breeze. Order Yours Today! A no-frills wine tote that performs as expected. The rave review is based on the price. I'm a comparison shopper, and I expect to pay the lowest price and still receive good quality and value. Simply Good Stuff delivers! I finally received my wine totes after waiting for weeks and was a little disappointed in them. I like the quality of the items, however I ordered them specifically because they said they woould hole a 1.5 liter bottle of wine or 2 smaller bottles. Well, it barely fits a 1.5 bottle with the top sticking up through the material. HOwever, it does fit, but probably will not fit with a wine stopper if the bottle is not finished. Oh well. Live and learn. I guess they just don't make a good 1.5 liter bottle carrier. Would be a good idea to make one. As a two bottle holder, it is good. So, all in all it was just ok.
What sized wine bottles can tote hold? 2-750 mL or 2-1.5 L.
It is designed for use with 2 standard, 750 ml bottles. Insulate And Protect Wine Bottles On The Go. A Safe And Easy Storage Solution.